In the summer of 1990, Joy traveled as an exchange student to Oslo, Norway. 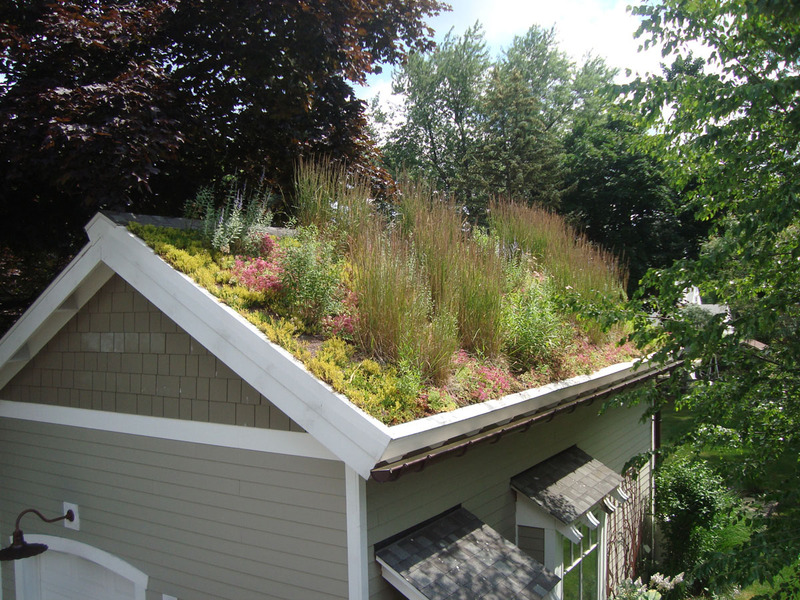 Her experience as an exchange student would go on to impact various facets of her adult life, but an interesting impact came in the form of green roofs. 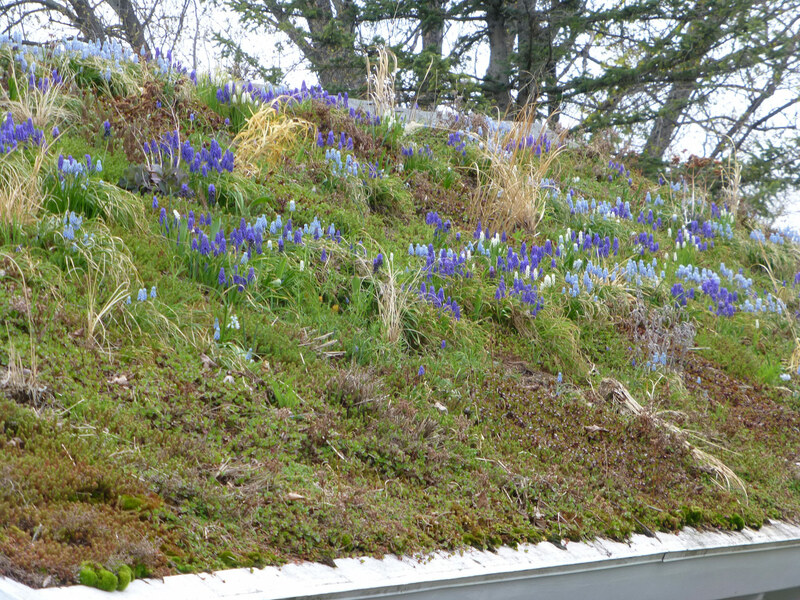 Throughout her travels, she saw green roofs interwoven into a wide range of Norway’s architectural styles, from historic shepherd cottages found on mountainsides to contemporary high rises in downtown centers. 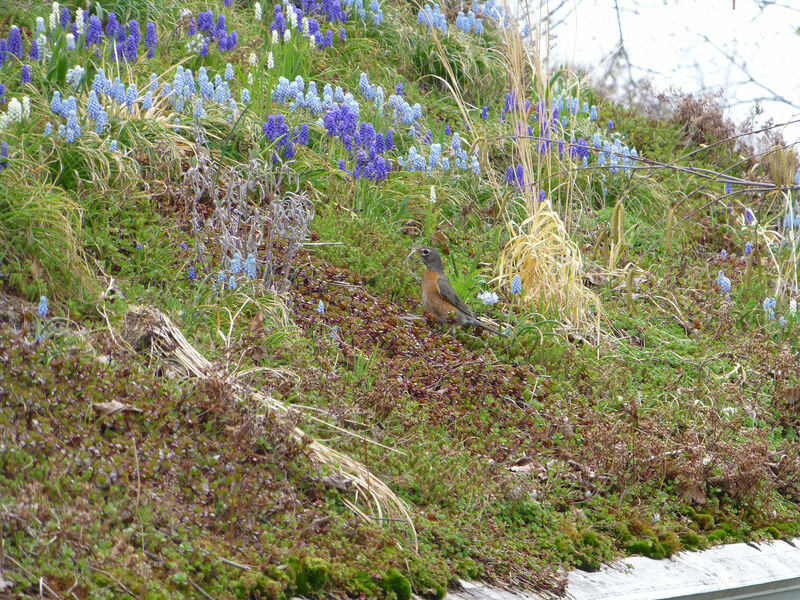 By in large, these roofs were lush with plantings indicative of Norway’s broader landscape. 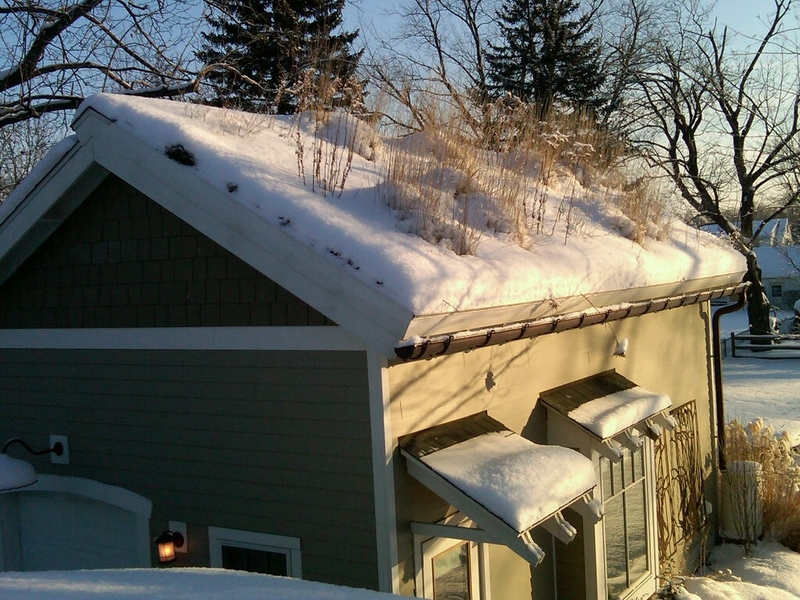 More than a decade later, her own green roof would become the first residential green roof to be constructed in Western NY. A few years into the launch of her company, JKLA was in need of a dedicated office space that would allow Joy to be close to her young family and accommodate the business’ growth. As landscape architects, JKLA’s work in sustainable practice is driven by a deep commitment to supporting the natural world and to design systems that strengthen and leverage the ecosystem services our landscapes provide to us. 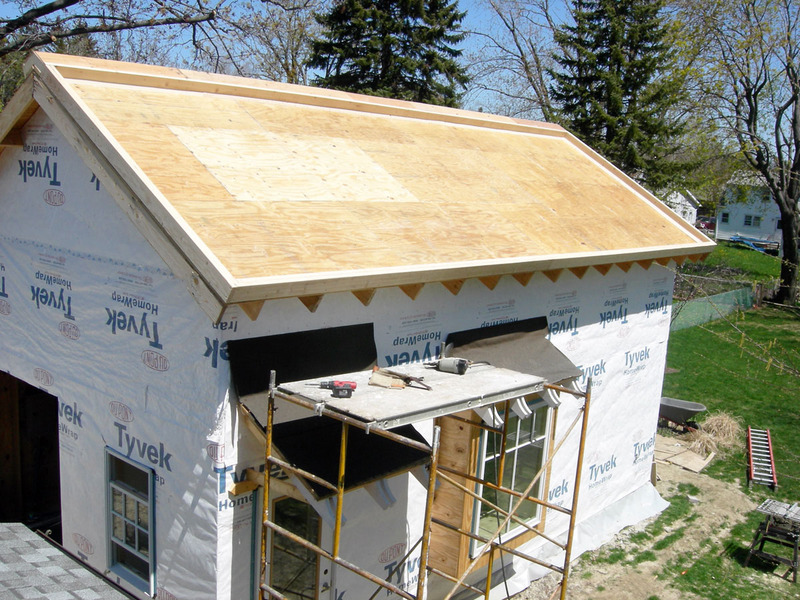 When designing a new facility for the company, it was imperative that the new garage structure on her property match the context of her neighborhood, but that it also showcased her commitment to sustainable design and construction. 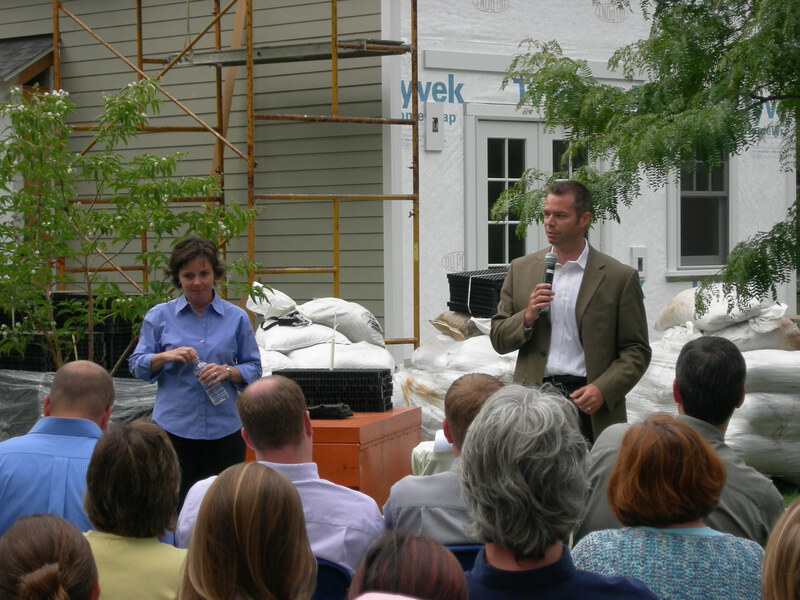 The result was a 500sf building designed to meet the equivalent of a LEED Silver for Residential project, prior to a residential rating system actually being developed by LEED. The building’s proportions, window placement, insulation system, and mechanical systems were all designed to meet a Silver threshold of sustainability. 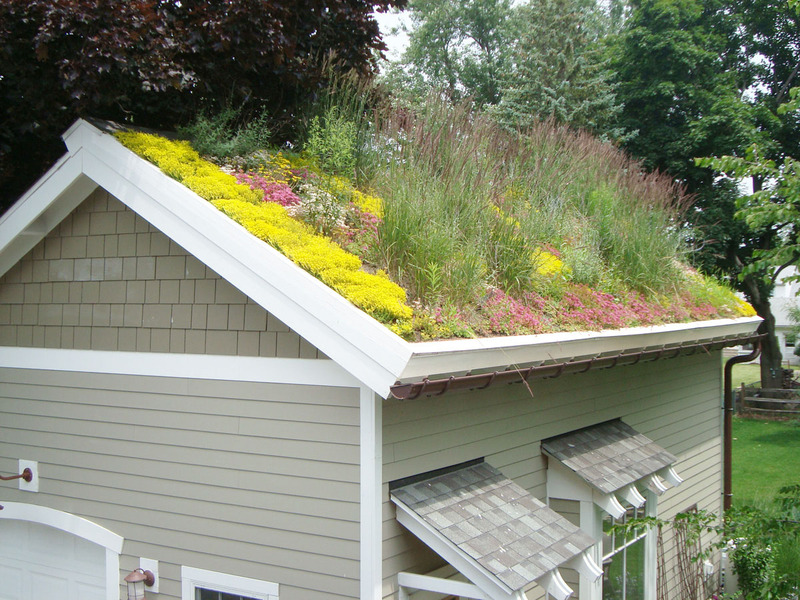 The green roof, planted as a lush landscape with a variety of sedum, ornamental grasses and perennials, is indicative of the green roofs Joy saw in Norway many years before, and in many ways has become the crowning glory of this sustainable residential scale building. 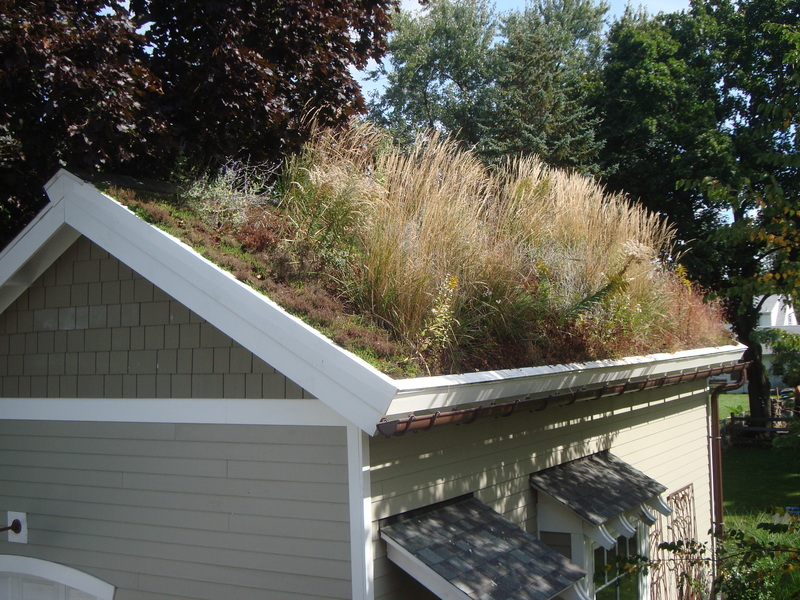 Designing a green roof was a new undertaking for us in the early years of the company, but was something we had been following professionally for many years. At the same time we were designing our own green roof, we had the opportunity to design a green roof for Niagara University with our design partner Cannon Design. The roof at Niagara was a flat roof with pedestrian access, and planted to be a lush garden with seating, while our equally lush roof, albeit much smaller roof, was to be a 7:12 pitch and accessed only from a ladder. Lichtenfels Nursery from Johnstown, PA was the selected installer for the Niagara University green roof and agreed to work with us on our own project. 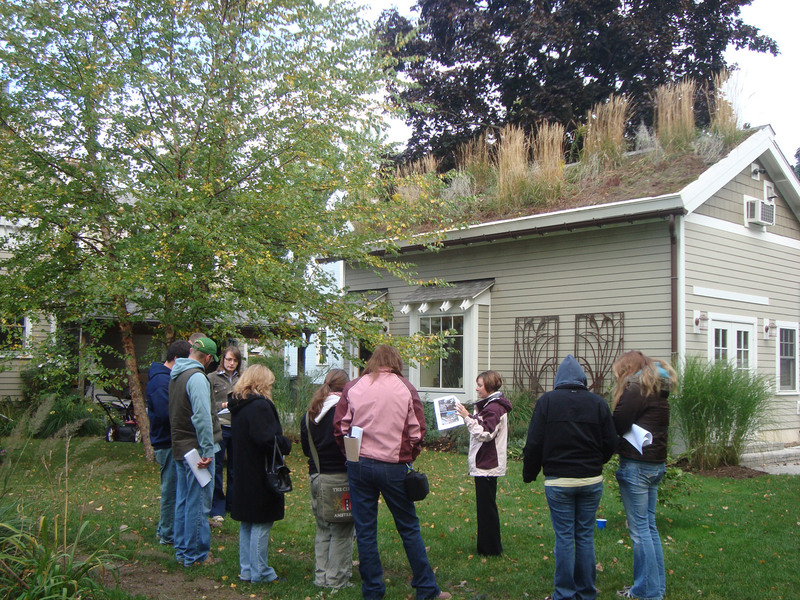 As collaboration is at our core, and because the design and construction of green roofs were certainly new to the Western NY area, we saw an interesting opportunity to bring technology and education together. 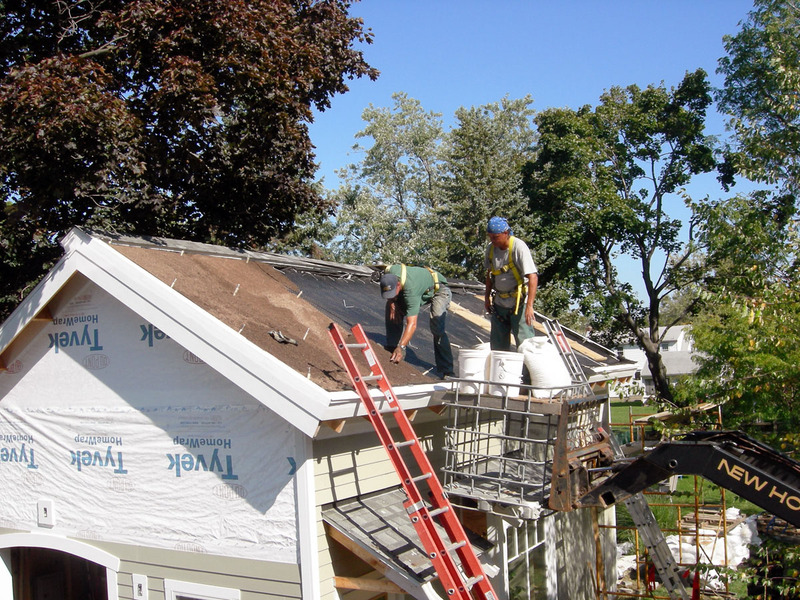 In October of 2007, we hosted a continuing education event with more than 60 attendees ranging from architects, landscape architects, students, representatives from NY State Parks as well as roofing contractors. 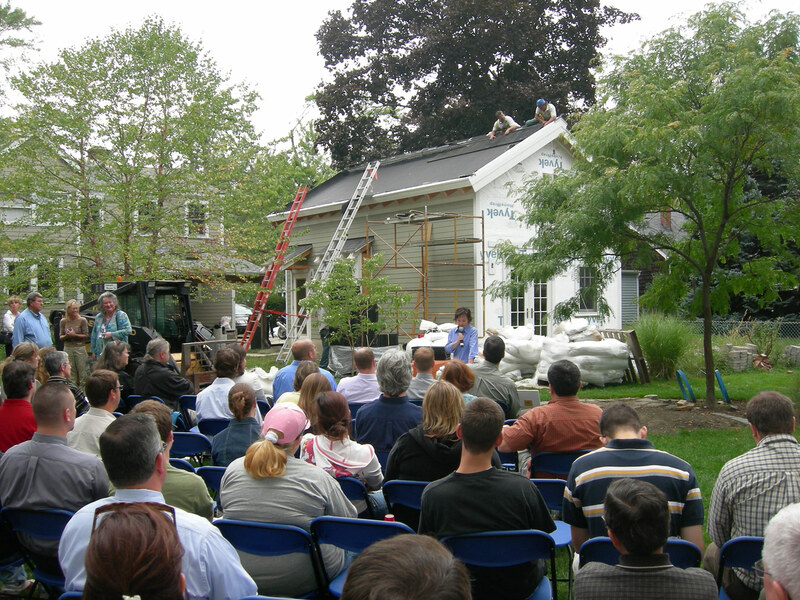 The session highlighted the design of the small building and its LEED opportunities, the value of stormwater management and a presentation by the installer, Lichtenfels Nursery, highlighting the components of a successful roof, its design, and detailing. 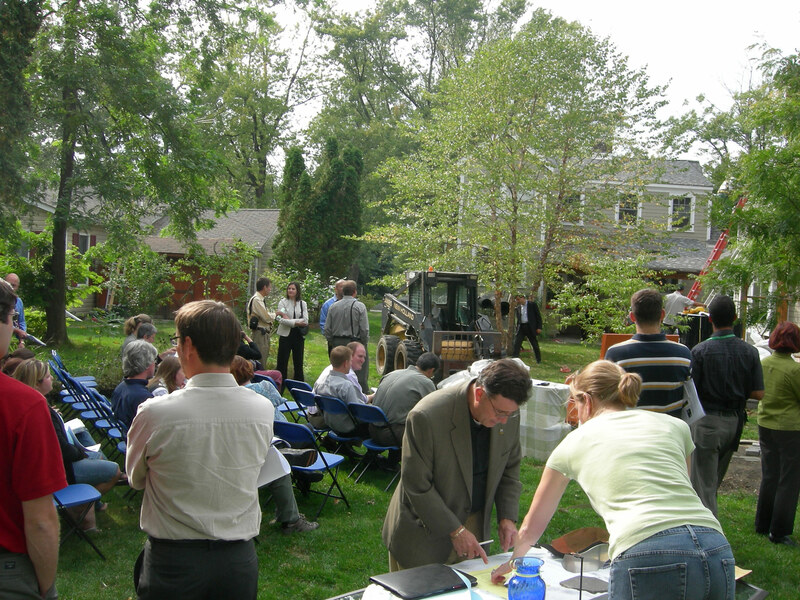 Throughout the presentations the participants were able to touch the materials and components, ask specific questions of the designers and see a live demonstration of our green roof being installed. 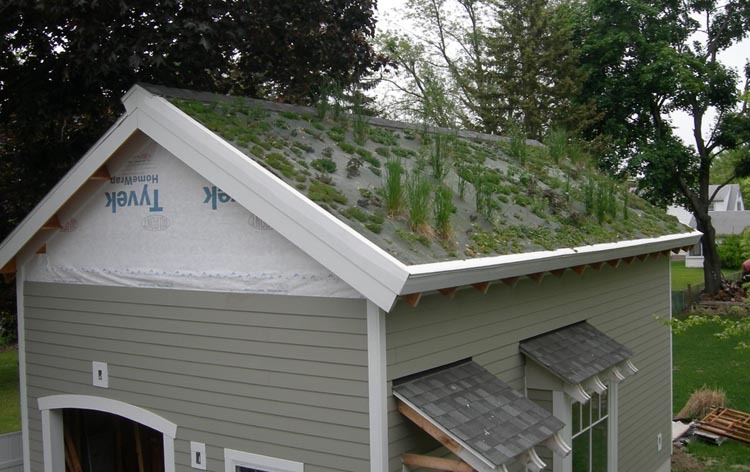 As part of our commitment to sustainability and to education around green infrastructure, JKLA uses the roof as a living laboratory. 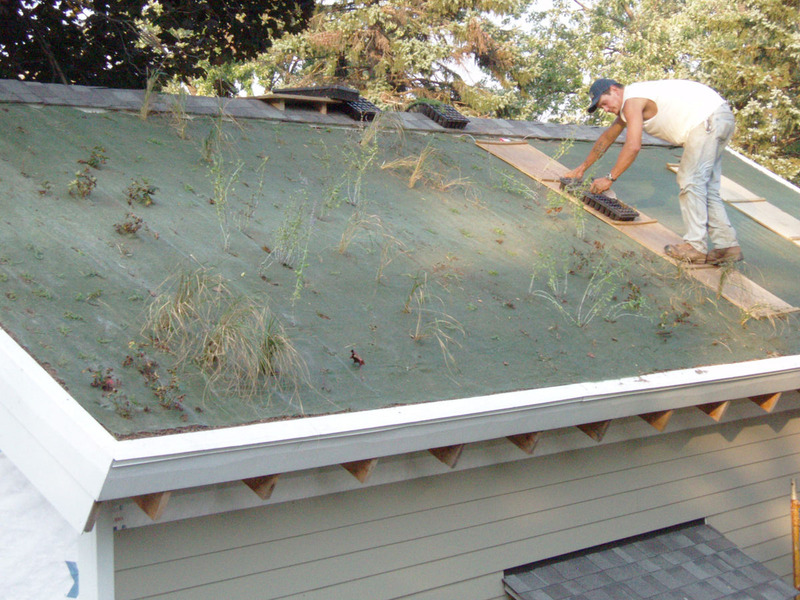 Understanding which plants will have long term success in extreme conditions is important to our continued success with green roofs. We monitor rain fall but do not supplement irrigation to observe plant hardiness under drought conditions. Only one side of our roof is green but we collect runoff from each side in rain barrels, allowing us to monitor for water quantity and quality. 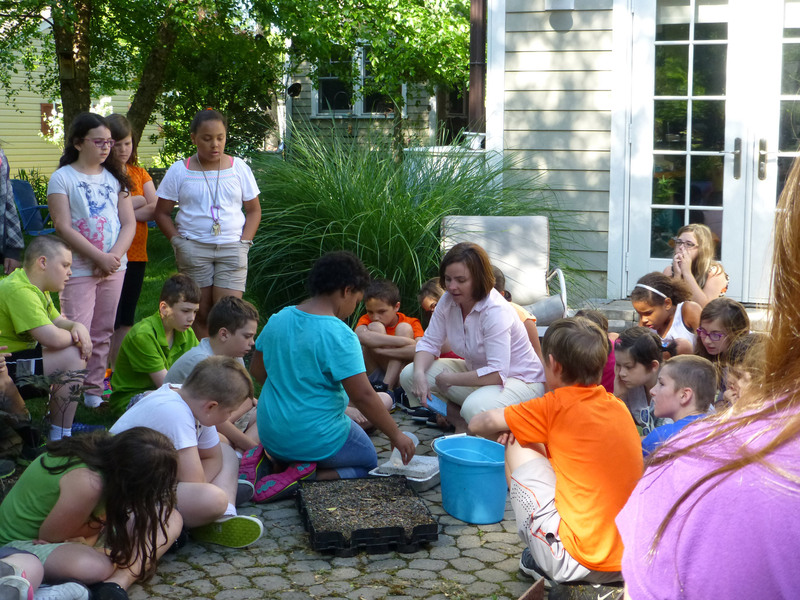 At JKLA we regularly host groups and tours ranging from local 4th graders studying the water cycle and horticulture students at Niagara County Community College, to participants of the WNY Sustainable Energy Association’s annual Solar Tour.